SMART 30R ID Card Printer | Rewrite Your ID Cards. SMART 30R printer uses direct thermal rewritable technology enabling you to erase and rewrite onto the same blank plastic ID card, becoming the perfect solution for producing temporary ID cards. SMART 30R allows you to erase and rewrite on your cards as many times as you wish automatically saving you money! This fantastic rewritable printer manages to erase and rewrite onto your ID card in just 20 seconds! Saving an amazing amount of time producing cards for visitors who arrive on the premises! The SMART 30R printer has available upgrade features such as; magnetic stripe encoder, contact and contactless Encoder. 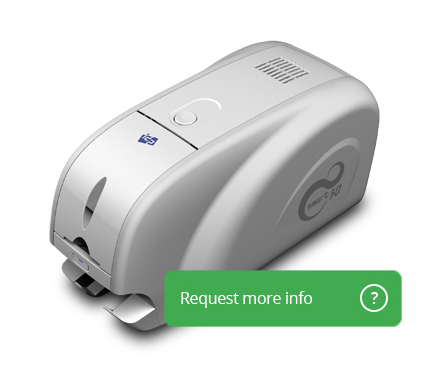 The SMART 30R has been designed so that you can connect your printer up to your PC is just a few minutes! Simply plug your USB cable into the USB port and you are on your way to producing your identification cards! However, SMART 30R can also be upgraded to a Ethernet printer enabling wireless printer - this is the perfect feature for work places with little space to put these two gadgets together.